I am delighted to be here this exciting morning in Seattle, a millennial city virtually surrounded by water, craft beer and coffee. 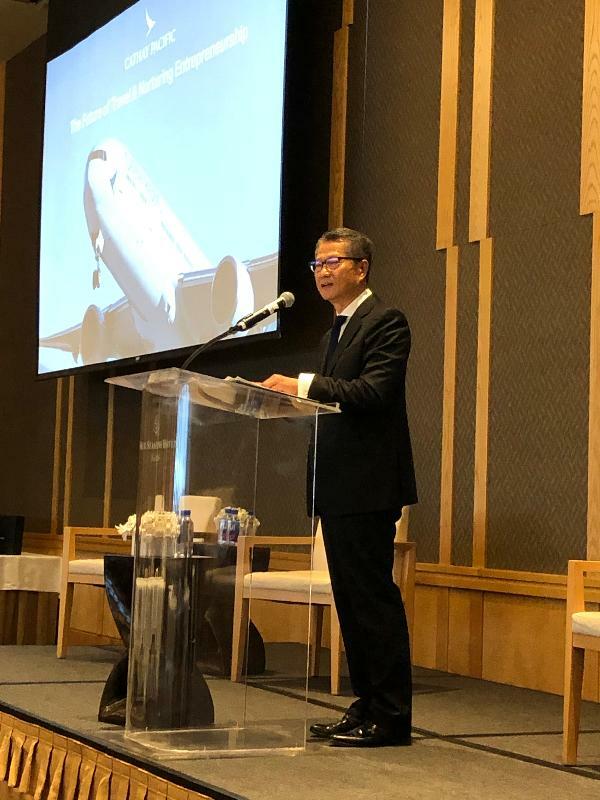 My thanks to Cathay Pacific Airways for organising today's Connecting Hong Kong-Seattle Business Seminar, and the support of our Economic and Trade Office in San Francisco. Cathay's launch of direct passenger flights brings more than our two cities together. The new service will create connections well beyond our respective airports – connections in business, government, culture and more. And they will, I'm confident, help us all excel. Our two cities, and the business and people who drive them, believe in the promise of innovation and technology (I&T). And I'm sure today's panel discussions will kindle expanded co-operation and collaboration between us in the months and years to come. When it comes to Hong Kong and I&T, our airport is a good place to begin. One of the world's top three passenger hubs, Hong Kong International Airport welcomed almost 75 million passengers last year, connecting them to more than 220 destinations around the world. As good as those numbers are, they are bound to soar in the coming years, thanks to the Three-runway System now under construction at our airport. The project is equivalent to building a brand-new mega airport. It involves expanding the current Terminal 2 and creating a new Third Runway Passenger Building with a floor area of more than 3 million square feet. That's a lot of space to cover and, with some 100 million passengers a year expected by 2030, it's a lot of people to manage between the arrival and departure gates. We'll make that expansion happen thanks to I&T, just as we're doing now. I&T are helping the airport create a more convenient and hassle-free journey for its passengers. It begins with the "HKG My Flight" mobile app, which provides personalised, real-time flight information and boarding alerts. And, thanks to iBeacon and augmented reality technologies, passengers can make their way from kerb to gate easily, as the app translates airport signage into any of nine popular languages. The mobile app also monitors real-time, car-park space availability and you can book a parking space in advance through this app. No small triumph for a major international airport. Once paired with MyTAG, an RFID-embedded smart luggage tag, the mobile app also lets passengers know when their luggage is at the baggage claim carousel, putting passengers at ease. Furthermore, last September, the airport launched the e-Security Gates. Using facial recognition technology, the system verifies identity of departing passengers before they enter the restricted area. Our Airport Authority is now exploring the use of passengers' facial biometrics as a single token from check-in to boarding. Technology is humming behind the scenes as well. Hong Kong International Airport's trolley tracking system employs video analytic technology to manage more than 13 000 trolleys. And it's also testing the use of an autonomous tractor to enhance efficiency. That's only a sampling of how technology is transforming Hong Kong International Airport but that speaks volume of how technology can do us a world of good. Acknowledging that, we are committed to developing Hong Kong into a world-class smart city. Our Smart City Blueprint, published in 2017, includes more than 70 initiatives covering six major areas, namely Smart Mobility, Smart Economy, Smart Environment, Smart People, Smart Living, and of course, Smart Government. Many of the technologies in use at the airport are some key components underpinning Smart Mobility. I must also highlight that many of these technologies were developed in collaboration with local companies and R&D institutions based in Hong Kong, which brings me to the second focus of today's seminar – nurturing entrepreneurship. Entrepreneurs flourish in an enabling environment, one that allows them to focus on what matters: building their business. Hong Kong offers that and a great deal more. Our unique "one country, two systems" arrangement is supported by an established common law legal system backed by the rule of law and reassuring intellectual property protection. Our financial services sector competes with London and New York for global business. And our universities are world class, with four among the top 100 globally. You can also count on our low and simple tax regime and sophisticated communications and logistics infrastructure. Add it all up and you know why Hong Kong's start-up scene is booming. At last count, more than 2,600 start-ups called Hong Kong home. That's up 18 per cent over 2017. We are now among the world's five fastest-growing start-up centres. Internationally celebrated innovation laboratories and accelerator programmes such as the Accenture FinTech Innovation Lab and the SuperCharger fintech accelerator have also established a presence in Hong Kong. It helps that our investment promotion agency, Invest Hong Kong, runs the StartmeupHK programme, which encourages innovative and scalable start-ups to look to Hong Kong for their business future. Not surprisingly, venture-capital investment in our start-ups is soaring. Last year, it reached US$2.3 billion – some 13 times more than that in 2014. The Hong Kong SAR Government is also a factor, enabling and promoting targeted economic sectors. That certainly includes I&T, a central policy priority. To encourage more private venture capital funds to invest in Hong Kong start-ups, we have established the US$250 million Innovation and Technology Venture Fund. It invests with private venture capital funds on a matching basis. Over and above that, in just the past two years, we have committed over US$12 billion to a raft of initiatives and programmes for boosting our I&T sector. They include expanding our focus on infrastructure and R&D, developing talent, supporting I&T companies and institutions and driving re-industrialisation . At the Hong Kong boundary with the mainland of China, we are now developing the Hong Kong-Shenzhen Innovation and Technology Park on a space some four times the current size of our Science Park, that means over 13 million square feet. It's expected that the first-batch land parcels will be made available for construction by 2021. The new Park will take full advantage of its proximity to the supply chain, manufacturing capabilities and technology talent pool across the boundary in Shenzhen. R&D is also a priority. And we have committed about US$1.2 billion to establish two innovative clusters at our Science Park. Health@InnoHK will target healthcare technology, while AIR@InnoHK will specialise in artificial intelligence and robotics. The two R&D centres will give Hong Kong an edge – a powerful selling point – in attracting top international universities, research institutions and technology companies. And to ensure that innovative proposals stand a better chance of winning government contracts, we are introducing a pro-innovation government procurement policy. There's more government incentives in our enhanced tax deductions – offering companies deductions of up to 300 per cent for their R&D expenditure. To ensure a continuing flow of talent, our Technology Talent Admission Scheme , established last year, expedites the admission of individuals with R&D expertise to Hong Kong. Furthermore, our Talent List system provides fast-track approvals for I&T experts, data scientists and cyber-security specialists, financial technology experts and others with the specialisations we need to realise the boundless opportunities for Hong Kong to seize. That certainly includes the Guangdong-Hong Kong-Macao Greater Bay Area, a cluster city development embracing Hong Kong, Macao and nine flourishing cities in Pearl River Delta in Guangdong. Together, the Greater Bay Area presents an enormous market, with a population of more than 70 million consumers and a collective GDP of US$1.6 trillion. The Bay Area's Outline Development Plan released in February looks to Hong Kong to play a lead role in several sectors, including financial services, trade, transport – and that includes aviation of course – as well as I&T. Indeed, the Bay Area is expected to rise as an international I&T hub, connecting the region's upstream, midstream and downstream sectors. And that, ladies and gentlemen, can expand the opportunities for Hong Kong – and the companies that work with us. On that note of co-operation and boundless promise, I think it's time for this morning's panellists – high-profile business and non-governmental players – to give us their considered take on travel, entrepreneurship, I&T and the future of the two world's great cities: Seattle and Hong Kong. I wish you all a rewarding seminar and a very enjoyable direct flight to Hong Kong in your future.